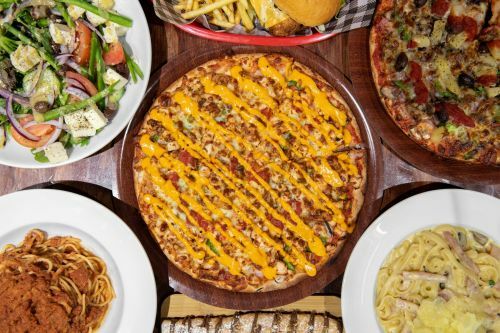 Jailhouse Rock Pizza and Pasta - Earlwood uses their own specialised couriers to deliver their food. Italian mozzarella cheese on a tomato base with a dash of garlic & oregano. Salami, pepperoni, cabanossi, ham, onions, capsicum, mushroom, olives, pineapple mozzarella cheese & garlic. Prawns, Salami, pepperoni, cabanossi, ham, onions, capsicum, mushroom, olives, pineapple mozzarella cheese, garlic & a dash of oregano. Anchovies, olives, mozzarella cheese with a dash of garlic & oregano. Bacon, egg & mozzarella cheese. Ground beef, onion, spicy pepperoni, olives & feta cheese. Hot spicy pepperoni & mozzarella cheese. Fresh mushrooms, onion, capsicum, olives, pineapple & mozzarella cheese. Ham, fresh mushrooms, capsicum, onion & mozzarella cheese. Ground beef, mild salami, cabanossi, hot pepperoni, ham, mozzarella cheese & BBQ sauce. Hot spicy pepperoni, capsicum, onion, chilli & mozzarella cheese. Ham, fresh mushrooms, olives, anchovies & mozzarella cheese. Roasted eggplant, ground beef, onion, roasted almonds & mozzarella cheese. Ham, mushrooms, pineapple, sweet corn & mozzarella cheese. Chicken, fresh mushrooms, capsicum, homemade satay sauce with a light sprinkle of mozzarella cheese. Tender pieces of chicken marinated in Cajun spices, thin sliced capsicum, onion & mozzarella cheese. Tender pieces of Tandoori chicken marinated in Indian spices, thin sliced capsicum, onion & mozzarella cheese. Fresh spinach, onion, garlic, oregano, olives, feta cheese & mozzarella cheese. Marinated eggplant, artichokes, fresh capsicum, mushrooms, olives, sun-dried tomatoes, fresh herbs, onion & mozzarella cheese. Fresh spinach, Spanish onion, avocado, capsicum, roasted eggplant, mushrooms, artichokes, sun-dried tomato, sprinkled oregano & garlic with mozzarella cheese. Pepperoni, marinated eggplant, olives, onion, fresh herbs, garlic & a light sprinkle of mozzarella cheese. Fresh Italian salami, marinated eggplant, marinated artichokes, sun-dried tomatoes, capsicum, herbs, extra virgin olive oil, fresh mushrooms & a light sprinkle of mozzarella cheese. Ground beef or chicken, fresh mushrooms, capsicum, onion, olives & mozzarella cheese. Italian mild salami, artichokes, sun-dried tomatoes, olives, capsicum, anchovies & mozzarella cheese. Sun-dried tomatoes, olives, mozzarella cheese, halloumi cheese & feta cheese. Onion, capsicum, chicken with homemade peri peri sauce & mozzarella cheese. Sun dried tomatoes, salami, cheese, olives, garlic prawn, oregano and pizza sauce. King prawns, calamari, smoked salmon, mussels, olives, shallots & mozzarella cheese. Prawns, crab, onion, sun-dried tomatoes, olives, herbs & mozzarella cheese. Prawns, crab, fresh garlic & mozzarella cheese. Prawns, fresh garlic & mozzarella cheese. King prawns pan-fried in butter with mushrooms, shallots, herbs & cream sauce. King prawns, calamari, mussels, salmon, fresh garlic in napolitana sauce. Fettuccine chilli, king prawns, haloumi cheese, sun dried tomatoes, finished off with olive oil, Spanish & Parmesan cheese. Pan-fried tender chicken breast fillet with prawns, green pepper corns, with a creamy tomato sauce. Tender chicken breast or veal with king prawns cooked in butter, shallots, herbs, mushroom in a cream sauce. King prawns, calamari, mussels, smoked salmon, lettuce, tomato, cucumber, onions, capsicum, Kalamata olives with our homemade salad dressing.